Institute will feel this was two points dropped rather than one gained, as they let slip a two goal lead at Ballyclare Comrades on Friday night. Leading 2-0 at half-time thanks Michael McCrudden and Stephen O’Donnell goals, Comrades somehow earned a point with two quick fire goals through Michael McQuitty and Gary Brown. ‘Stute boss Kevin Deery will be a frustrated man as his side should have easily seen out the game after missing chances to score a third and were in complete control until McQuitty’s first goal on 74 minutes. Institute gave a full debut to midfielder, Ryan Doherty, as winger Stephen Curry dropped to the bench, while Ryan Morrow returned from suspension to replace Dean Curry. The visitors started brightly and had a half chance on six minutes but Sean McCarron’s tame left footed strike after was easily gathered by keeper Paddy Flood. The woodwork came to the home side’s rescue on 16 minutes as Michael McCrudden’s fantastic left foot volley from the edge of the box, which had keeper Flood beaten, rattled against the post. ‘Stute eventually took the lead on 21 minutes in superb fashion as Niall Grace won possession before feeding McCrudden inside the box and he made no mistake from close range. The Drumahoe side doubled their advantage on 40 minutes as McCarron put Flood under pressure when a high ball came into the box and while the keeper managed to punch the ball into the air, O’Donnell was on hand to head home the loose ball. McCarron had a great chance to add a third on 50 minutes after Ciaron Harkin’s right wing centre found the striker inside the box but his low drive was straight at Flood. Minutes later Doherty broke clear down the left before cutting the ball back to McCrudden but the midfielder slid the ball wide with the goal at his mercy. 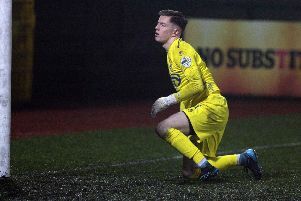 Soon after the visitors had to make a change as goalkeeper Harry Doherty came off the bench for his debut to replace the injury Marty Gallagher. And what a debut it was as the home side then scored twice in two minutes to incredibly level things on 76 minutes. First, centre-back Michael McQuitty turned the ball home after Doherty failed to deal with Michael O’Hanlon’s initial corner. And straight away, the Comrades levelled things when Gary Brown’s 20 yard strike took a deflection on it’s way past Doherty. Right at the death Chris Trussell got in behind Mark Scoltock but, after bearing down on goal, he fired wide from just inside the box. Ballyclare Comrades: Flood, Woods, Youle (Shannon 82), McMullan, McQuitty, McCullough, Brown, Dobbin, Trussell, O’Hanlon, Robinson (Irwin 85). Institute: Gallagher (H Doherty 58), Morrow, O’Donnell, Scoltock, McFadden; A Harkin, C Harkin, R Doherty (Cooley 77); McCrudden, McCarron (S Curry 67), Grace.